Dubai, United Arab Emirates, March 27, 2018: Al-Futtaim Auto & Machinery Company (Famco), exclusive distributor of Volvo Trucks in the UAE, recently announced the launch of the Volvo Trucks that meets Euro 5 emission standards. The introduction of the new Euro 5 engines supports the UAE Government’s Vision 2021 to provide a safer environment and to work towards providing a sustainable future. As part of the Government's efforts, Emirates Authority For Standardization and Metrology (ESMA) recently mandated that all trucks imported starting this year must meet Euro 4 emission standards. Famco and Volvo Trucks Middle East have taken a step further and introduced the Euro 5-compliant trucks. The new Volvo Trucks are equipped with On-Board Diagnostics (OBD), which helps monitor the level of AdBlue liquid that together with Selective Catalytic Reduction (SCR) technology helps lower emission levels. The OBD also easily provides authorities with information regarding the emission levels of the trucks during inspection. Alongside the launch of the Euro 5 models, Famco also launched the Globetrotter cab for the Volvo FH. In addition to being more advanced than existing sleeper cabins in its class, the Globetrotter cabs provide a very high level of safety and comfort for drivers and a newer driving experience which directly reciprocates into better productivity. 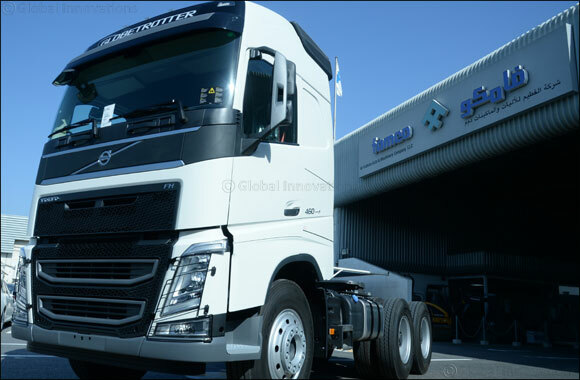 The Globetrotter cab is 340mm taller than the current Volvo FH sleeper cabs and is aerodynamically designed with smooth surfaces and rounded corners at the front which provides better fuel efficiency. The windscreen is bonded to the body, resulting in less noise in the cabin and better crash protection.